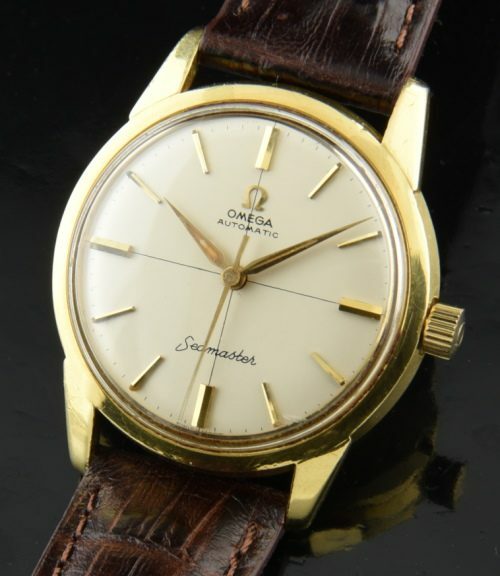 This 1960 OMEGA SEAMASTER measures 34mm. and has a heavy and uncommonly found solid 18k. gold screw-back sea monster case with correct winding crown. The crosshair dial having raised gold markers and Dauphine hands are all original and quite clean. The fine caliber 591 20 jewel movement was recently cleaned and is maintaining accurate time. Finding these 18k. OMEGA specimens is becoming harder these days. This watch has a pure and simple appearance.